One of the subtleties of NQM is that it is scaleable to play at regimental/brigade level through to Army/front level, a point that is not always picked up by a cursory review. 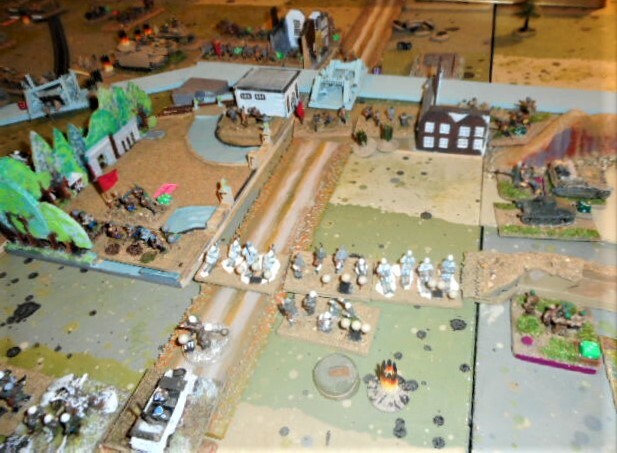 The guidelines, as written in 1985 or thereabouts took a three strength point (SP) stand as a company, scaling up one level of command from Frank Chadwick’s platoon-as-a-basic-combat-unit Command Decision, and using his Europa map. This can be considered to be a Regimental Scale Orbat (RSO) with a battalion being about 12 SPs. Chadwick achieved his three army groups by downscaling (bathtubbing) them to the size of three corps. I liked this approach, but it had problems as originally written with artillery ranges being too long, and the weight of artillery being too light at army group aka corps level. I changed my approach for the first time in game March 1942. Frank describes Command Decision as a tactical game but by bathtubbing, he handles an operational game well. 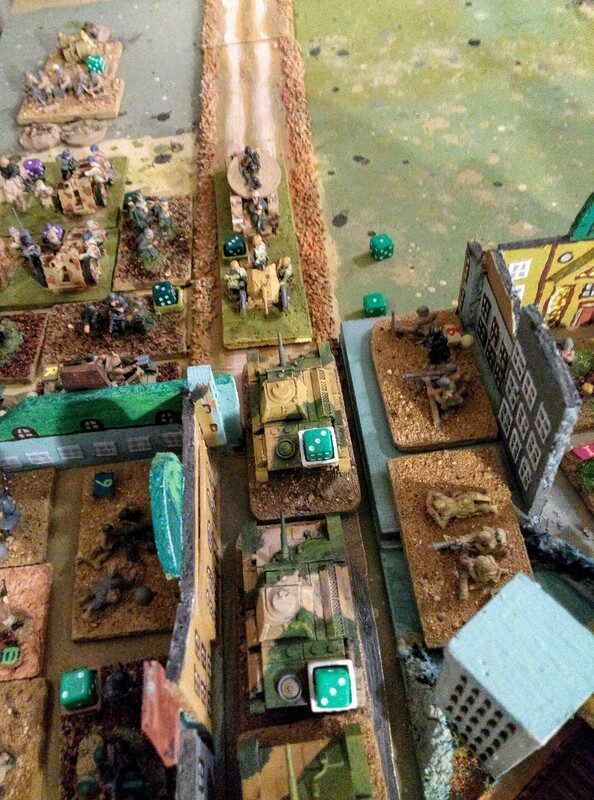 Notwithstanding, the idea was a marked shift away from the idea that the Eastern Front could only be played with towers of cardboard counters on a map, and it still works well. By upscaling, and halving the strength of a battalion to 6 SPs an NQM player could easily handle a couple of battalions in contact at the same time, i.e. a brigade of 18 or so SPs not counting supporting arms from division, which would bring it to around 24 SPs. 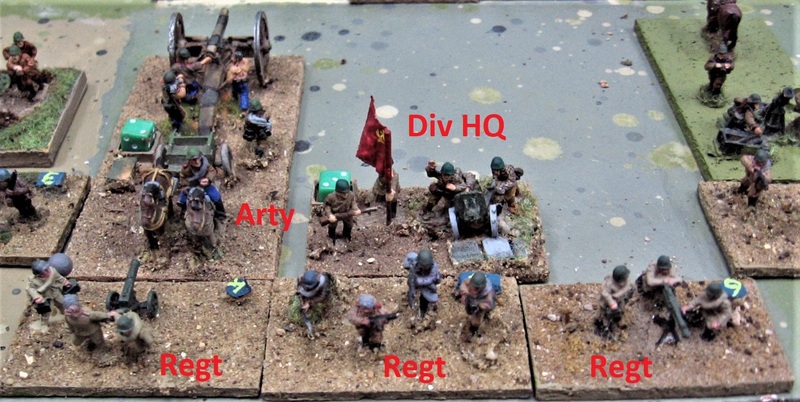 At this scale it was still important to distinguish between fighting and support stands to give tactical flavour, so the Divisional Scale Orbat (DSO) was a bridge between tactical and operational level games. The next shift really came with Tim Gow and Bob Cordery developing Megablitz, which took a single unit of variable strength to be a battalion. This is broadly equivalent to the NQM Corps Scale Orbat (CSO), and a single player can comfortably handle a couple of divisions in combat simultaneously i.e. a corps. At this scale, it was no longer important to differentiate the fighting and support elements of a a 3 SP battalion. The Front Scale Orbat (FSO) has been around for some time – ever since the Battle for GIROVKA Bend was played in 2012, although it was not stated as such. It was achieved by bathtubbing a 6SP battalion and calling it a division, ignoring the havoc that this creates with the divisional supporting arms and simply showing them at corps/army level. Formalising the system makes a 12 SP regiment/brigade into a division, so a 3 SP battalion is acting as a regiment/brigade, making a battalion effectively 1 SP. Ground scale has not been mentioned so far, it being an elastic concept. In setting up the game, I have always looked at the area of operation to be played, scaled it to the available space on the table, then worked backwards to the forces filling the board. Likewise, time can be elastic. Sometimes an operation of 6-18 moves will cover 1-3 days, weeks or even months. It works for me, and confuses players if I haven’t taken enough time to explain it properly to them. Alamein was played at CSO over a few game days, with two day and one night move per game day. Air Army: HQ, 1-5 Po-2, 3 Fighters, 3 IL-2 Stormoviks, up to 5 Reserve fighters, Li-2 Tpt. It should be noted that this is schematic – I can fit a front of 12 divisions comfortably onto a 12 x4 square area of the board. The whole setup with squares looks very Napoleonic to my eyes. Fronts typically might cover 240km, which would make a square between 15km -20km, and means that at this scale all ranges are contact with the adjacent square only, or at best, corps, army and front artillery one square behind the lead division. Nierhorster gives snapshot orbats for certain stages of the war. YesthatPhil has already given thought to this sort of thing with Megablitz squared, and Bob Cordery has a published solo set of Hexblitz (2018). The reason for pushing the scale upward, is that 1943 saw some very large-scale operations take place. The last time that I fought KURSK in 20mm, it took a whole day. 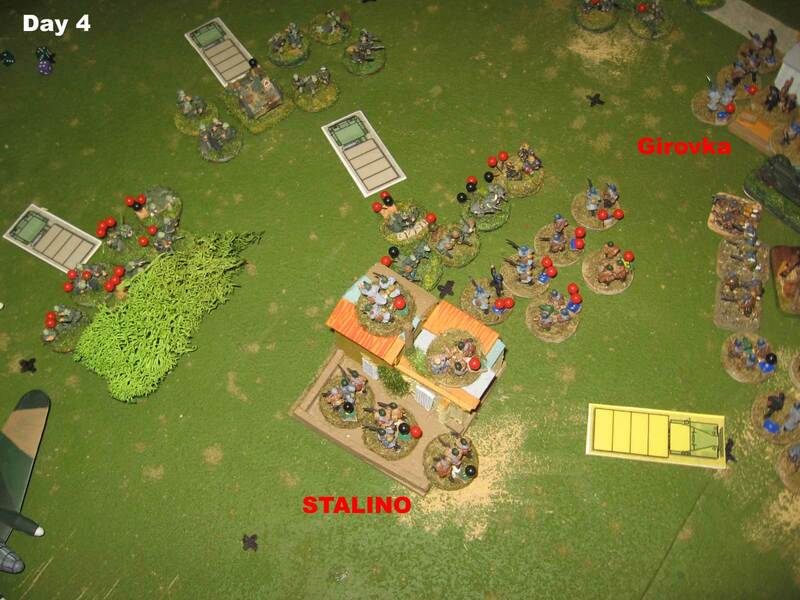 STALINGRAD was soloed over three weeks in bathtubbed DSO – alas before I owned a digital camera. Something more manageable is needed for a weekday evening if I am to finish the Eastern Front in my own lifetime 🙂 . Hubert Pölz has been scooting about quite happily in his unfinished die-cast Stuka since 2012¹. His Ju-87 finally got a nose job and some spats to finish the project. The usual 5 minutes of Google “research” suggests that the whole Geschwäder adopted the Schlange as its emblem. I would support that view based on pictures showing what I believe are slight variations of the snake with different serial numbers and camouflage patterns on the Stukas pictured. The variations show sharp-edged lines in angular or wavy lines, and spotted upper wing surfaces. What is less clear, is if the snake was an outline only, or sand or red. I went with red, after having originally painted just an outline, based only on the tonal differences in black and white pictures between the infill and the sand camouflage on the adjacent cowling on one of the pictures. It is entirely possible that all 3 variations are correct for different aircraft in the Geschwäder at different times! Pictured fuselage serials are T6+CP, T6+DP, and T6+MP or T6+AN, with the aircraft letter repeated on the front of the spats. I’m less worried about the underwing letters of J, D, B, K as they cannot be seen in a wargame. It is suggested that Pölz actually flew T6+CP. Hubert Pölz’s Ju-87 T6+AN enjoying taxi-ing on a proper set of wheels and spats. The spats and nosecone were modelled out of Milliput Finecast, glued on once set, with a spare wheel cut in half to finish the job. The Stuka now sits at a properly rakish angle when on the ground and looks a little more convincing. One of the benefits of this blog is that it has helped me to realise how time is slipping by. As a reward for performing well on the DNEPR line, the Romanian Division has been rebased and finished¹ after many years. They have always been at the end of the line for arms and equipment. 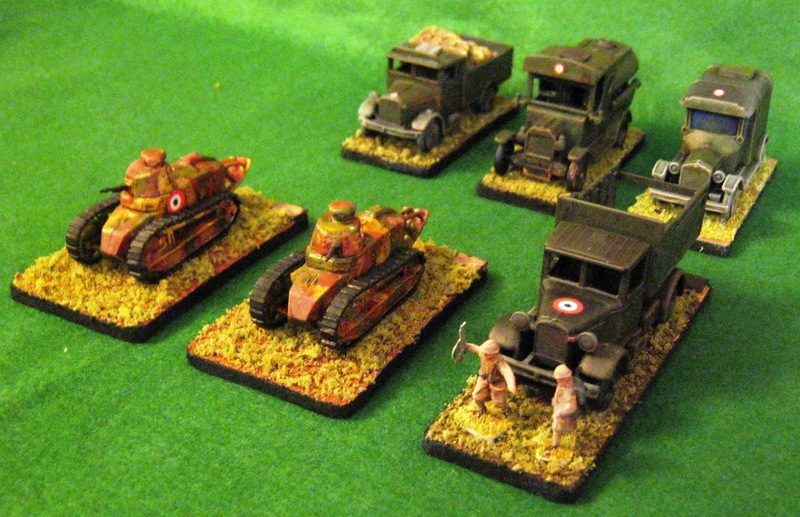 Their artillery has been, and still is, a cast-off Airfix 20mm standing in as a field artillery piece.The logistic truck was made originally by Ian Lowell for his French 20mm Rapid Fire army. It looks ridiculously large next to the R-1, which is fine. The Schneider 47mm anti-tank gun came from a tank game, kindly donated by Bob Cordery, many years back. It had some 1/200 panthers in it, the tracks of which came in very useful for the extra Raupenschlepper Ost models in the PSC pack. The oxen are not strictly legit, but I had them lying around already based, and they are fun. The divisional command stand is an eclectic mix of command figures from both World Wars. I painted the officers’ lips red, as they were allowed to use makeup if of field rank or higher! As 9th Infantry Division closed to the west of DNEPROPETROVSK and the southern river crossing, Romanian troops from I Corps, added their weight to the attack, driving north along the line of the river. Despite a fierce defence, the weight of fire wore 66 Rifle Division down, until the surviving remnants were destroyed at the bridge. In the photograph above, if one looks carefully in the top right, the totality of my Romanian armoured collection can be seen – a solitary R-1. In deteriorating weather conditions, the Soviet winter offensive ended with the crossings over the DNEPR in Soviet hands at ZAPOROZHYE but Axis hands at DNEPROPETROVSK. Phil returned this week as General of Panzers Stahl, and Steve continued as General Gordov commanding 33 Army. The house rule for Bridge repair was that infantry could infiltrate one battalion across the river every turn as it was being repaired. The bridge started at -12 Hit points, with 1d6 being thrown per two pioneer companies working on the bridge. Once the score was positive, that number of strength points could cross each turn, with bases not being allowed to part-cross, up to a maximum of +12. Enemy medium artillery and air power of medium and above could fire at the bridge counting it as a light target to reduce the carrying capacity of the bridge. This week, I ruled that engineers could not work on the bridge and fight off enemy panzers at the same time. Confusingly, during this operation, we had a lot of similarly numbered units! The winter of 1942/43 saw the Axis Powers losing ground on all fronts. In the south around KHARKOV, a line had briefly stabilised around the upper DON and the lower DNEPR, with the land bridge between them looking vulnerable. Stavka exploited this weakness attacking with two Fronts to force the Axis frontline back onto KHARKOV, and breaching the DNEPR at DNEPROPETROVSK and ZAPAROZHE. The two photographs of the strategic map should not be taken too literally. Some units are at much-reduced strength, and yet others are not shown on the map. A Major update of the map is currently underway as reinforcements appear on both sides for the summer campaigns. The attack, when it came, fell on 68 Rifle Division but initially failed to dislodge them in the Northwest sector of the city. The attack continued to build, being reinforced by the second echelon, and by I Corps, pushing the Soviets back into 67 Division’s positions to the southwest. 67 Rifle Division then attacked north, to retake the northwest of the city, taking advantage of Stormovik attacks disrupting the already-battered Silesians, at which point the evening ended with coffee and chocolate brownies. Tim was back this week to reprise his role as General of Infantry Fröhlich, and Steve continued as General Gordov commanding 33 Army. The house rule for Bridge repair was that infantry could infiltrate one battalion across the river every turn as it was being repaired. The bridge started at -12 Hit points, with 1d6 being thrown per two pioneer companies working on the bridge. Once the score was positive, that number of strength points could cross each turn, with bases not being allowed to part-cross, up to a maximum of +12. Enemy medium artillery and air power of medium and above could fire at the bridge counting it as a light target to reduce the carrying capacity of the bridge. The Silesian Reservists of 62nd Infantry Division had been force-marching from NIKOPOL to reinforce the breach in the line. Both sides rolled ones. I ask you, what else can an Umpire to do? The Battle for The DNEPR river progressed pretty much according to plan for the two Soviet armies. Army Group South, had little with which to reinforce the front, and what it did have – 1 Mountain Division in the south, and 9 Infantry Division to the west – was fully occupied or too far away to affect the initial battle. It is easy to imagine Scouts infiltrating across under the cover of darkness of smoke, but if the gap was more like the bridge below, with ice churning through the gap, then the difficulty becomes more apparent. ZAPOROZHYE suffered a similar state as Colonel General Vasily Gordov concentrated on reducing the city one block (square) at a time. He benefited from sparing use of his attached army level artillery and armour, and the confidence that came from knowing that the front-level artillery was drawing ever closer. In the event, it was not needed but clattered majestically onto the board at the end of the game as if it owned the table. Deftly switching his attached tank brigades from attacking the north of the city to the south gave him the ability to selectively reinforce his assaulting infantry at key parts of the battle. 68 Infantry Division lost all of its infantry regiments on the east side of the river when General Meissner gave the order to demolish the bridge. Only the divisional headquarters and rear echelon troops survived to form the nucleus of a new division. It was still not enough to prevent the Soviets from forcing the river line. Although it was only their second game of NQMsq, Tim and Steven picked the fundamentals up quickly. 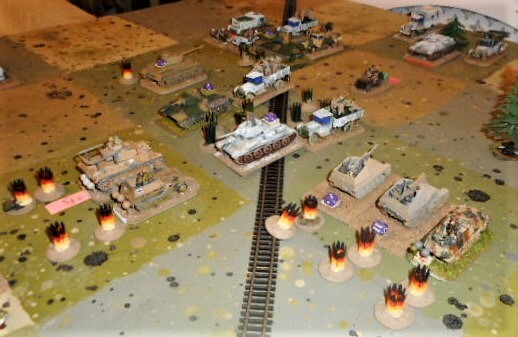 The whole game took 3 hours, not including setup time, and each player handled two divisions, with Army level support on the Soviet side Apart from some loose ends that need to be soloed, the winter of 1942/3 has drawn to a close now, with troops resting and refitting ready for the summer campaigns when the roads dry out after the Rasputitsa. Against all expectation, the Romanians usually do well, probably because no-one expects too much of them. They spend a LOT of time in the box between games. 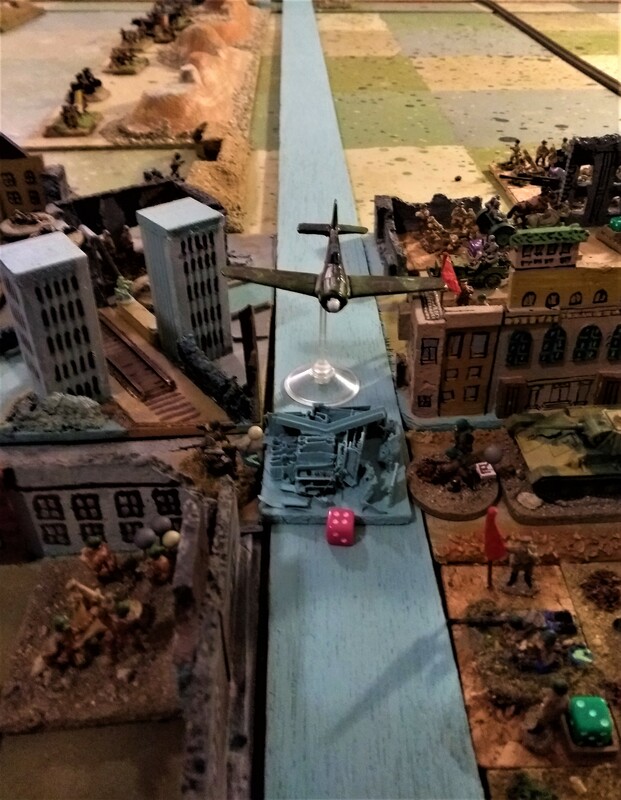 The house rule was to roll 4-6 on 1d6 for the German Commander to successfully blow the bridge under fire, becoming easier by one on each subsequent turn. 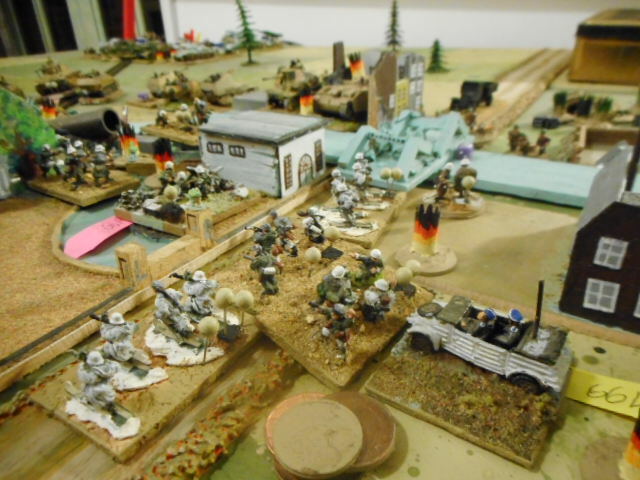 The Soviets could then attempt a crossing if they won the firefight with the far bank – 6 on 1d6 at the first attempt, becoming easier by one on each subsequent turn provided they continued to win the firefight. As the Battle for KHARKOV drew to its conclusion in Army Group South, the weaker southern flank was having its own tribulations. Held more lightly than the centre, with a large proportion of minor allied troops (Romanians, Hungarians and Italians) the front had all but collapsed over winter, and as the Soviet Voronezh Front pushed hard against Generakl Kleist’s XLIV Korps, the Southern Front advanced 33rd and 22nd Armies against the key cities of ZAPOROZHYE (ZAPORIZHIZHIA in modern Ukranian) and DNEPROPETROVSK (DNIPRO on Google map)¹. This far south, the first signs of the spring thaw were making it clear that the cities would have to be taken soon, or not at all. The pressure was on Colonel General Andrei I. Yeremenko. The Operation at DNEPROPETROVSK begins where the last game finished after a long winter pause for reorganisation on both sides. Whereas I had more this in mind. Regardless, the ruling for this operation was that crossing was possible only via bridges. The Soviets still chanced their arm and placed a company of Scouts in the centre of the river with much talk of rubber boats and wading gear. They drowned. 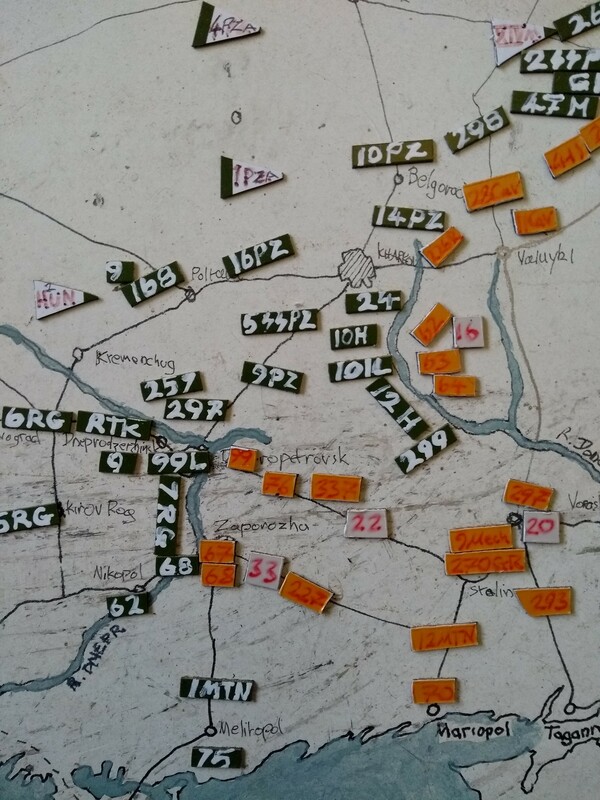 68 Infantry Division, a veteran Viennese formation, was defending ZAPOROZHYE with its rail marshalling yards. The bulk of the city was on the east bank of the DNEPR, which gave the divisional commander, Maj Gen Meissner, a difficult choice on his reserve demolition of the main rail bridge on the southern outskirts of the city. If destroyed too early, his division would be cut off; too late and he could lose the river crossing. 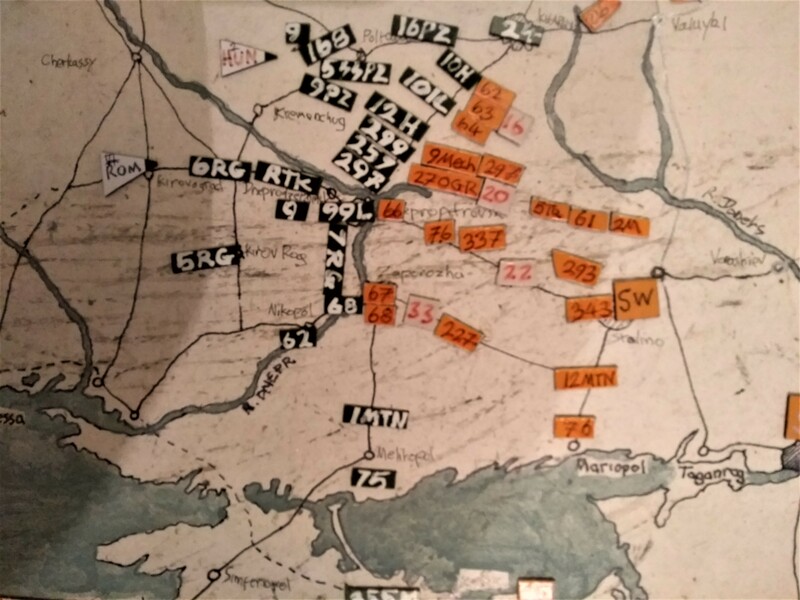 DNEPROPETROVSK was held by 99 Jäger Division (Regular Viennese, Lt Gen Krakau)² and 9 Infantry Division (Regular Hessen-Nassau, Maj Gen Gebb), although the latter played no part in the early battle, having been pulled to the northeast to cover a gap in the line. 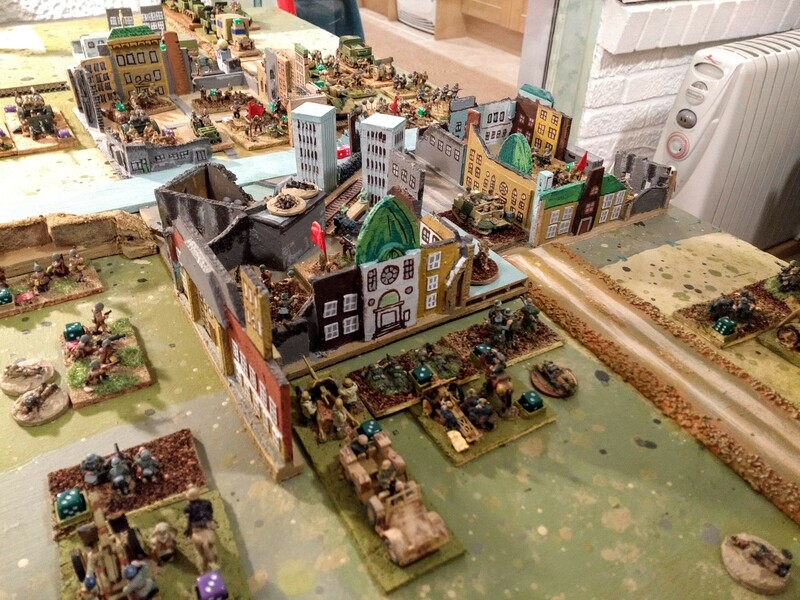 Players for this game were Tim Merry commanding the German lines, Steven Churchus commanding 33 Army attacking ZAPOROZHYE, and YesthatPhil commanding 22 Army against DNEPROPETROVSK. Trebian was still recovering from head wounds sustained during his heroic attack at the front of 20 Guards Rifle Division at KHARKOV, and was unavailable. 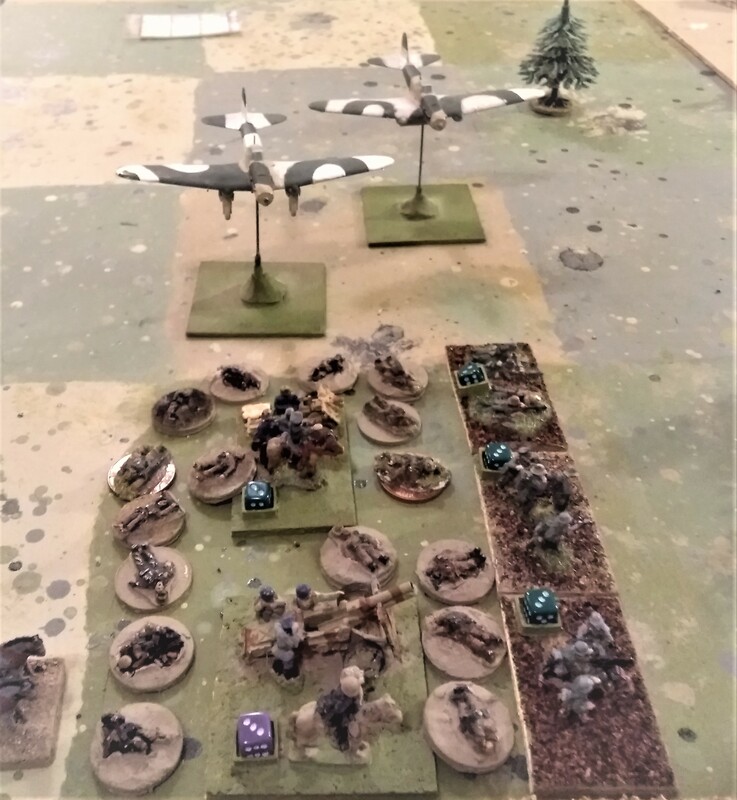 We were playing NQM squared with the Corps Scale Orbat, and it seemed to be going well enough, albeit with the usual umpire tidying up of Div HQs that had wandered off to command other divisions, and the odd cheeky Scout company that thought they might not be spotted creeping over the river. The decision to start modelling guns and limbers together on a single base was vindicated when even Phil got his (badly labelled on my part) units tangled up. 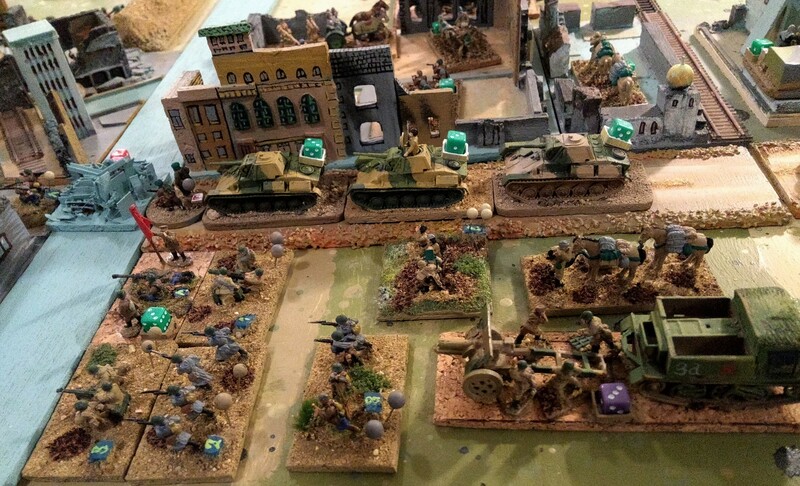 Steven, who was newer to hordes of indistinguishable Soviets fared even worse, which is why I am in favour of players bringing their own toys to the table – they know their own troops better – even if it does highlight my cheerfully sketchy painting (more of that later). Frank Chadwick rendered ZAPOROZHYE as the more pronounceable ZAPOROZHA. 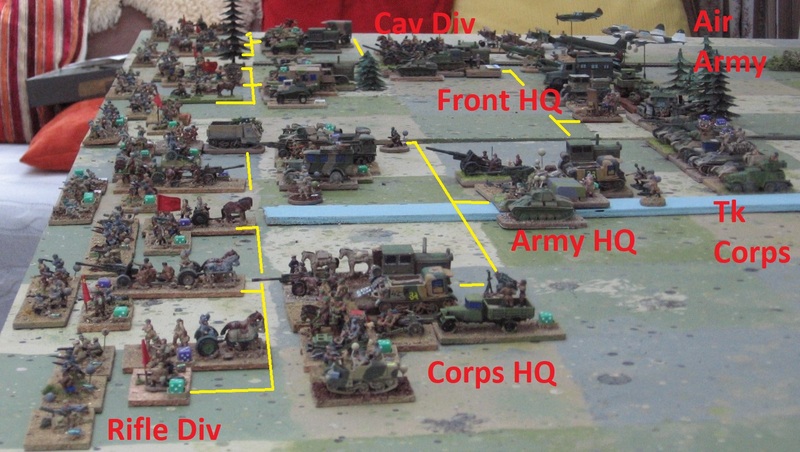 Reorganised as 7 Mountain Division in winter 41/42. Its NQM equivalent is still in DNEPROPETROVSK, however. 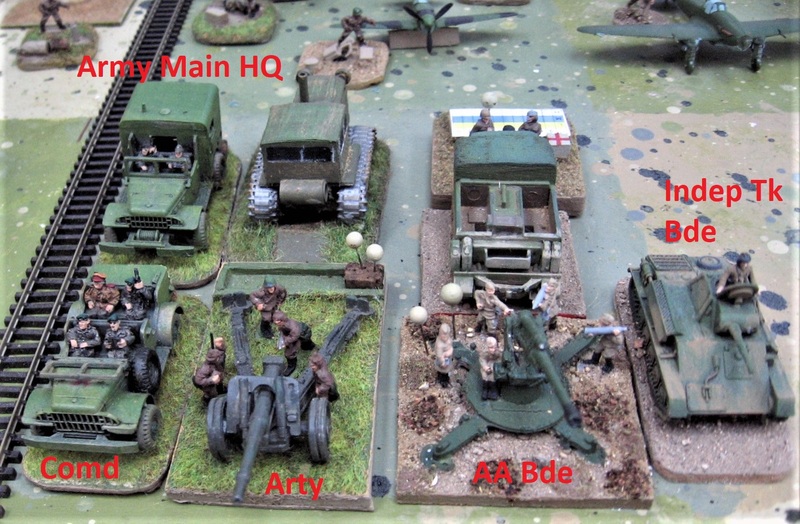 I have had my eye on a True North M1931 203 mm howitzer¹ from Old Glory UK for some time, as although Irregular Miniatures offer one in their Really Useful Guns range, the casting is a tad too generically vague, even for me. I know that this shouldn’t matter for a representational piece in a corps scale game, but I’m allowed to be irrational and inconsistent if I want. The tractor fits together with little trouble with a gap that needs filling or hiding between the engine block and the cab, which is in 5 pieces. Mine came with two left doors, and I couldn’t be bothered to ask for a right door. Someone has a kit somewhere with no left door! It is a little trickier to fit the tracks square to the howitzer. If you just stick them to the trail, they will angle inwards. Everything else goes together with a minimum of filing. There is no obvious point to mount the derrick,but the picture below, and others show it on the left hand side of the trail, looking towards the barrel. The seats that flank the gun are a little tricky to line up, but again, pictures show them knocked out of position, and I wonder how much they were actually used in practice. The gun was towed in two pieces, and the 350 horsepower Voroshilovez Heavy tractor was used to pull the carriage, replacing the 131 horsepower Komintern heavy tractor shown above. The Komintern was retained to tow the barrel on its separate carriage. For such a solid model, my usual cork bases are not stiff enough, so I used 5mm structural plywood. This will not be an issue for anyone mounting the gun and tractor separately. The inclusion of the trolley used for moving shells is a nice touch. Pictures show all sorts of makeshift ramps in gun positions. All in all, a very satisfying solid pair of models for annoying your German opponent. 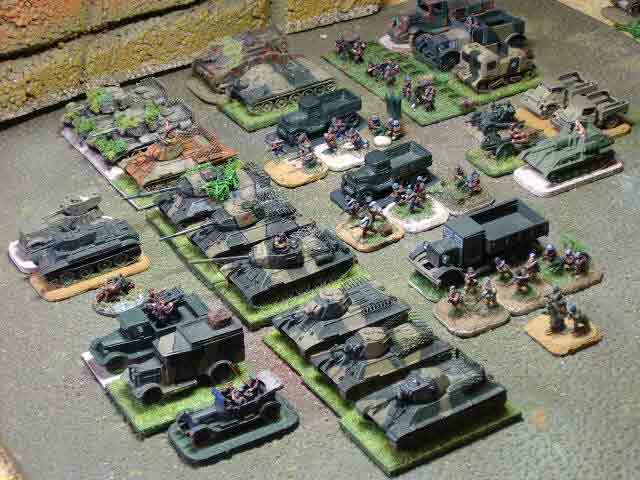 They should be an essential part of any Soviet wargamer’s collection. After a couple of basecoats, some muddy brown and a highlight, the piece is battle ready rather than finished. It is just waiting for some Piggie crew, base texture and more mud! The link is to the picture on the US site as the UK one is down at the time of writing. The derrick is shown in the stowed position. It should really look more like the picture below. This model is a little gem. Previously, I have been used to seeing slightly skew, slightly over-chunky renditions of this multi-angled Hungarian armoured car. Not so with this model, which renders the sloping faces and angles convincingly. Missing is the frame antenna, but this can be added, and I would rather have a clean model than one with a heavy square antenna obscuring the profile. The usual downsides to printed models are here – visible print lines and the odd stringy bit of support that refuses to detach, but these are not overly obtrusive and will yield to patient trimming. I only need one model for the whole Eastern Front campaign, and mine is now battle ready waiting for its tri-colour camouflage to be applied.